I first met artist Samantha from Jetta's Nest at our Brown Owls group in Brisbane where she wowed us all with an incredible doll she had made with an intricately-painted sassy face. Since then, Sam's gorgeous faces have gone on to adorn button badges, as well as a range of soft toys, prints, art cards and gorgeous clothes for kids. 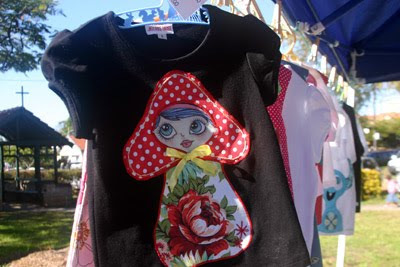 I particularly adore the range of Jetta's Nest appliqued children's clothes that incorporate Sam's art along with recycled/vintage materials. 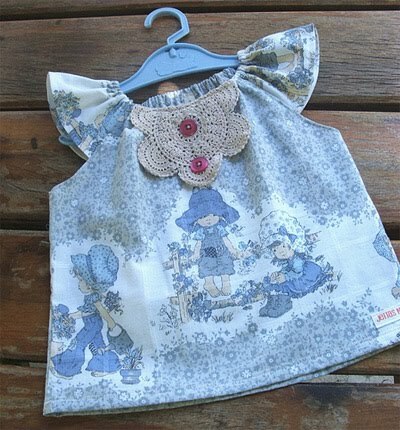 I have proudly collected a few pieces for little Sophie (both above) including the one-of-a-kind toadstool top and the gorgeous Flutterby top made from a recycled Holly Hobbie quilt cover, recycled doily and recycled buttons. Both destined for the "keep me" pile of special clothes. October is a really important month for us to all do our small part for Breast Cancer Awareness and Sam is generously donating 50% of the proceeds of her limited edition pink Lola Buttonhead brooches to the National Breast Cancer Foundation. You can find the crafty art of Jetta's Nest (and you can also put in a custom order) on Etsy and MadeIt (Australia) as well as various markets (including the upcoming BrisStyle handmade market in Deceomber). 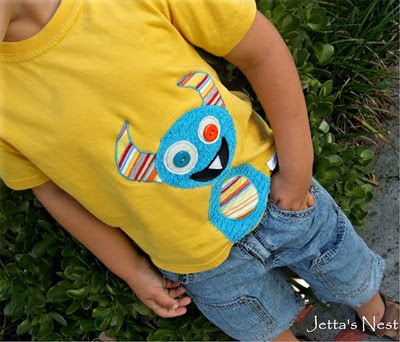 Check out the Jetta's Nest blog for a sneak peek on upcoming designs. Oh Steph, thanks so much for all the nice stuff you've said. The biggest compliment of all though is seeing the gorgeous little Sophie in her Jettas Nest creations! Sam's artwork is so amazing and unique, love it all!!! Can't wait to see her new products at the BrisStyle market. What a lucky little Sophie you have - that dress is super super cute. Almost too good for a kid to ruin! But then again, way to beautiful and good to not be worn proud until it falls apart. As a fellow BrisStylette, I can vouch that Sam's work is delightful and are always a hit at our markets. I particularly love the adorable tops she creates. Well done, Sam. yay .. I love Sam's stuff she is a true creative, thanks for the heads up on the pink Lola's ... heading over there now! Wow, so much love for Sam. Thanks Daneve, Christine, Rebecca, Ellie, Katie and Robyn. And you're welcome Sam!